The expanding remnant of SN 1987A, a Type II-P supernova in the Large Magellanic Cloud. NASA image. A Type II supernova (plural: supernovae or supernovas) results from the rapid collapse and violent explosion of a massive star. A star must have at least 8 times, but no more than 40 to 50 times, the mass of the Sun (M☉) to undergo this type of explosion. Type II supernovae are distinguished from other types of supernovae by the presence of hydrogen in their spectra. They are usually observed in the spiral arms of galaxies and in H II regions, but not in elliptical galaxies. Stars generate energy by the nuclear fusion of elements. Unlike the Sun, massive stars possess the mass needed to fuse elements that have an atomic mass greater than hydrogen and helium, albeit at increasingly higher temperatures and pressures, causing increasingly shorter stellar life spans. The degeneracy pressure of electrons and the energy generated by these fusion reactions are sufficient to counter the force of gravity and prevent the star from collapsing, maintaining stellar equilibrium. 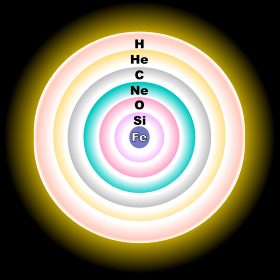 The star fuses increasingly higher mass elements, starting with hydrogen and then helium, progressing up through the periodic table until a core of iron and nickel is produced. Fusion of iron or nickel produces no net energy output, so no further fusion can take place, leaving the nickel–iron core inert. Due to the lack of energy output creating outward thermal pressure, the core contracts due to gravity until the overlying weight of the star can be supported largely by electron degeneracy pressure. When the compacted mass of the inert core exceeds the Chandrasekhar limit of about 1.4 M☉, electron degeneracy is no longer sufficient to counter the gravitational compression. A cataclysmic implosion of the core takes place within seconds. Without the support of the now-imploded inner core, the outer core collapses inwards under gravity and reaches a velocity of up to 23% of the speed of light and the sudden compression increases the temperature of the inner core to up to 100 billion kelvins. Neutrons and neutrinos are formed via reversed beta-decay, releasing about 1046 joules (100 foe) in a ten-second burst. Also, the collapse of the inner core is halted by neutron degeneracy, causing the implosion to rebound and bounce outward. The energy of this expanding shock wave is sufficient to disrupt the overlying stellar material and accelerate it to escape velocity, forming a supernova explosion. The shock wave and extremely high temperature and pressure rapidly dissipate but are present for long enough to allow for a brief period during which the production of elements heavier than iron occurs. Depending on initial size of the star, the remnants of the core form a neutron star or a black hole. Because of the underlying mechanism, the resulting supernova is also described as a core-collapse supernova. There exist several categories of Type II supernova explosions, which are categorized based on the resulting light curve—a graph of luminosity versus time—following the explosion. Type II-L supernovae show a steady (linear) decline of the light curve following the explosion, whereas Type II-P display a period of slower decline (a plateau) in their light curve followed by a normal decay. Type Ib and Ic supernovae are a type of core-collapse supernova for a massive star that has shed its outer envelope of hydrogen and (for Type Ic) helium. As a result, they appear to be lacking in these elements. Stars far more massive than the sun evolve in more complex ways. In the core of the star, hydrogen is fused into helium, releasing thermal energy that heats the sun's core and provides outward pressure that supports the sun's layers against collapse in a process known as stellar or hydrostatic equilibrium. The helium produced in the core accumulates there since temperatures in the core are not yet high enough to cause it to fuse. Eventually, as the hydrogen at the core is exhausted, fusion starts to slow down, and gravity causes the core to contract. This contraction raises the temperature high enough to initiate a shorter phase of helium fusion, which accounts for less than 10% of the star's total lifetime. In stars with fewer than eight solar masses, the carbon produced by helium fusion does not fuse, and the star gradually cools to become a white dwarf. White dwarf stars, if they have a near companion, may then become Type Ia supernovae. A much larger star, however, is massive enough to create temperatures and pressures needed to cause the carbon in the core to begin to fuse when the star contracts at the end of the helium-burning stage. The cores of these massive stars become layered like onions as progressively heavier atomic nuclei build up at the center, with an outermost layer of hydrogen gas, surrounding a layer of hydrogen fusing into helium, surrounding a layer of helium fusing into carbon via the triple-alpha process, surrounding layers that fuse to progressively heavier elements. As a star this massive evolves, it undergoes repeated stages where fusion in the core stops, and the core collapses until the pressure and temperature are sufficient to begin the next stage of fusion, reigniting to halt collapse. The factor limiting this process is the amount of energy that is released through fusion, which is dependent on the binding energy that holds together these atomic nuclei. Each additional step produces progressively heavier nuclei, which release progressively less energy when fusing. In addition, from carbon-burning onwards, energy loss via neutrino production becomes significant, leading to a higher rate of reaction than would otherwise take place. This continues until nickel-56 is produced, which decays radioactively into cobalt-56 and then iron-56 over the course of a few months. As iron and nickel have the highest binding energy per nucleon of all the elements, energy cannot be produced at the core by fusion, and a nickel-iron core grows. This core is under huge gravitational pressure. As there is no fusion to further raise the star's temperature to support it against collapse, it is supported only by degeneracy pressure of electrons. In this state, matter is so dense that further compaction would require electrons to occupy the same energy states. However, this is forbidden for identical fermion particles, such as the electron – a phenomenon called the Pauli exclusion principle. When the core's mass exceeds the Chandrasekhar limit of about 1.4 M☉, degeneracy pressure can no longer support it, and catastrophic collapse ensues. The outer part of the core reaches velocities of up to 7007700000000000000♠70000 km/s (23% of the speed of light) as it collapses toward the center of the star. The rapidly shrinking core heats up, producing high-energy gamma rays that decompose iron nuclei into helium nuclei and free neutrons via photodisintegration. As the core's density increases, it becomes energetically favorable for electrons and protons to merge via inverse beta decay, producing neutrons and elementary particles called neutrinos. Because neutrinos rarely interact with normal matter, they can escape from the core, carrying away energy and further accelerating the collapse, which proceeds over a timescale of milliseconds. As the core detaches from the outer layers of the star, some of these neutrinos are absorbed by the star's outer layers, beginning the supernova explosion. For Type II supernovae, the collapse is eventually halted by short-range repulsive neutron-neutron interactions, mediated by the strong force, as well as by degeneracy pressure of neutrons, at a density comparable to that of an atomic nucleus. When the collapse stops, the infalling matter rebounds, producing a shock wave that propagates outward. The energy from this shock dissociates heavy elements within the core. This reduces the energy of the shock, which can stall the explosion within the outer core. The core collapse phase is so dense and energetic that only neutrinos are able to escape. As the protons and electrons combine to form neutrons by means of electron capture, an electron neutrino is produced. In a typical Type II supernova, the newly formed neutron core has an initial temperature of about 100 billion kelvins, 104 times the temperature of the Sun's core. Much of this thermal energy must be shed for a stable neutron star to form, otherwise the neutrons would "boil away". This is accomplished by a further release of neutrinos. These 'thermal' neutrinos form as neutrino-antineutrino pairs of all flavors, and total several times the number of electron-capture neutrinos. The two neutrino production mechanisms convert the gravitational potential energy of the collapse into a ten-second neutrino burst, releasing about 1046 joules (100 foe). Through a process that is not clearly understood, about 1%, or 1044 joules (1 foe), of the energy released (in the form of neutrinos) is reabsorbed by the stalled shock, producing the supernova explosion. [a] Neutrinos generated by a supernova were observed in the case of Supernova 1987A, leading astrophysicists to conclude that the core collapse picture is basically correct. The water-based Kamiokande II and IMB instruments detected antineutrinos of thermal origin, while the gallium-71-based Baksan instrument detected neutrinos (lepton number = 1) of either thermal or electron-capture origin. Within a massive, evolved star (a) the onion-layered shells of elements undergo fusion, forming a nickel-iron core (b) that reaches Chandrasekhar-mass and starts to collapse. The inner part of the core is compressed into neutrons (c), causing infalling material to bounce (d) and form an outward-propagating shock front (red). The shock starts to stall (e), but it is re-invigorated by neutrino interaction. The surrounding material is blasted away (f), leaving only a degenerate remnant. When the progenitor star is below about 20 M☉ – depending on the strength of the explosion and the amount of material that falls back – the degenerate remnant of a core collapse is a neutron star. Above this mass, the remnant collapses to form a black hole. The theoretical limiting mass for this type of core collapse scenario is about 40–50 M☉. Above that mass, a star is believed to collapse directly into a black hole without forming a supernova explosion, although uncertainties in models of supernova collapse make calculation of these limits uncertain. The Standard Model of particle physics is a theory which describes three of the four known fundamental interactions between the elementary particles that make up all matter. This theory allows predictions to be made about how particles will interact under many conditions. The energy per particle in a supernova is typically 1–150 picojoules (tens to hundreds of MeV). [not in citation given] The per-particle energy involved in a supernova is small enough that the predictions gained from the Standard Model of particle physics are likely to be basically correct. But the high densities may require corrections to the Standard Model. In particular, Earth-based particle accelerators can produce particle interactions which are of much higher energy than are found in supernovae, but these experiments involve individual particles interacting with individual particles, and it is likely that the high densities within the supernova will produce novel effects. The interactions between neutrinos and the other particles in the supernova take place with the weak nuclear force, which is believed to be well understood. However, the interactions between the protons and neutrons involve the strong nuclear force, which is much less well understood. The major unsolved problem with Type II supernovae is that it is not understood how the burst of neutrinos transfers its energy to the rest of the star producing the shock wave which causes the star to explode. From the above discussion, only one percent of the energy needs to be transferred to produce an explosion, but explaining how that one percent of transfer occurs has proven very difficult, even though the particle interactions involved are believed to be well understood. In the 1990s, one model for doing this involved convective overturn, which suggests that convection, either from neutrinos from below, or infalling matter from above, completes the process of destroying the progenitor star. Heavier elements than iron are formed during this explosion by neutron capture, and from the pressure of the neutrinos pressing into the boundary of the "neutrinosphere", seeding the surrounding space with a cloud of gas and dust which is richer in heavy elements than the material from which the star originally formed. Neutrino physics, which is modeled by the Standard Model, is crucial to the understanding of this process. The other crucial area of investigation is the hydrodynamics of the plasma that makes up the dying star; how it behaves during the core collapse determines when and how the shockwave forms and when and how it stalls and is reenergized. In fact, some theoretical models incorporate a hydrodynamical instability in the stalled shock known as the "Standing Accretion Shock Instability" (SASI). This instability comes about as a consequence of non-spherical perturbations oscillating the stalled shock thereby deforming it. The SASI is often used in tandem with neutrino theories in computer simulations for re-energizing the stalled shock. Computer models have been very successful at calculating the behavior of Type II supernovae when the shock has been formed. By ignoring the first second of the explosion, and assuming that an explosion is started, astrophysicists have been able to make detailed predictions about the elements produced by the supernova and of the expected light curve from the supernova. This graph of the luminosity as a function of time shows the characteristic shapes of the light curves for a Type II-L and II-P supernova. When the spectrum of a Type II supernova is examined, it normally displays Balmer absorption lines – reduced flux at the characteristic frequencies where hydrogen atoms absorb energy. The presence of these lines is used to distinguish this category of supernova from a Type I supernova. When the luminosity of a Type II supernova is plotted over a period of time, it shows a characteristic rise to a peak brightness followed by a decline. These light curves have an average decay rate of 0.008 magnitudes per day; much lower than the decay rate for Type Ia supernovae. Type II is subdivided into two classes, depending on the shape of the light curve. The light curve for a Type II-L supernova shows a steady (linear) decline following the peak brightness. By contrast, the light curve of a Type II-P supernova has a distinctive flat stretch (called a plateau) during the decline; representing a period where the luminosity decays at a slower rate. The net luminosity decay rate is lower, at 0.0075 magnitudes per day for Type II-P, compared to 0.012 magnitudes per day for Type II-L. The difference in the shape of the light curves is believed to be caused, in the case of Type II-L supernovae, by the expulsion of most of the hydrogen envelope of the progenitor star. The plateau phase in Type II-P supernovae is due to a change in the opacity of the exterior layer. The shock wave ionizes the hydrogen in the outer envelope – stripping the electron from the hydrogen atom – resulting in a significant increase in the opacity. This prevents photons from the inner parts of the explosion from escaping. When the hydrogen cools sufficiently to recombine, the outer layer becomes transparent. The "n" denotes narrow, which indicates the presence of narrow or intermediate width hydrogen emission lines in the spectra. In the intermediate width case, the ejecta from the explosion may be interacting strongly with gas around the star – the circumstellar medium. The estimated circumstellar density required to explain the observational properties is much higher than that expected from the standard stellar evolution theory. It is generally assumed that the high circumstellar density is due to the high mass-loss rates of the Type IIn progenitors. The estimated mass-loss rates are typically higher than 6997100000000000000♠10−3 M☉ per year. There are indications that they originate as stars similar to Luminous blue variables with large mass losses before exploding. SN 1998S and SN 2005gl are examples of Type IIn supernovae; SN 2006gy, an extremely energetic supernova, may be another example. A Type IIb supernova has a weak hydrogen line in its initial spectrum, which is why it is classified as a Type II. However, later on the H emission becomes undetectable, and there is also a second peak in the light curve that has a spectrum which more closely resembles a Type Ib supernova. The progenitor could have been a massive star that expelled most of its outer layers, or one which lost most of its hydrogen envelope due to interactions with a companion in a binary system, leaving behind the core that consisted almost entirely of helium. As the ejecta of a Type IIb expands, the hydrogen layer quickly becomes more transparent and reveals the deeper layers. The classic example of a Type IIb supernova is SN 1993J, while another example is Cassiopeia A. The IIb class was first introduced (as a theoretical concept) by Woosley et al. in 1987, and the class was soon applied to SN 1987K and SN 1993J. Hypernovae are a rare type of supernova substantially more luminous and energetic than standard supernovae. 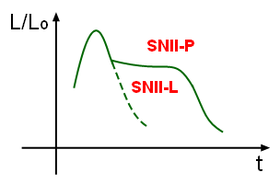 Examples are SN 1997ef (type Ic) and SN 1997cy (type IIn). Hypernovae are produced by more than one type of event: relativistic jets during formation of a black hole from fallback of material onto the neutron star core, the collapsar model; interaction with a dense envelope of circumstellar material, the CSM model; the highest mass pair instability supernovae; possibly others such as binary and quark star model. Stars with initial masses between about 25 and 90 times the sun develop cores large enough that after a supernova explosion, some material will fall back onto the neutron star core and create a black hole. In many cases this reduces the luminosity of the supernova, and above 90 M☉ the star collapses directly into a black hole without a supernova explosion. However, if the progenitor is spinning quickly enough the infalling material generates relativistic jets that emit more energy than the original explosion. They may also be seen directly if beamed towards us, giving the impression of an even more luminous object. In some cases these can produce gamma-ray bursts, although not all gamma-ray bursts are from supernovae. In some cases a type II supernova occurs when the star is surrounded by a very dense cloud of material, most likely expelled during luminous blue variable eruptions. This material is shocked by the explosion and becomes more luminous than a standard supernova. It is likely that there is a range of luminosities for these type IIn supernovae with only the brightest qualifying as a hypernova. Pair instability supernovae occur when an oxygen core in an extremely massive star becomes hot enough that gamma rays spontaneously produce electron-positron pairs. This causes the core to collapse, but where the collapse of an iron core causes endothermic fusion to heavier elements, the collapse of an oxygen core creates runaway exothermic fusion which completely unbinds the star. The total energy emitted depends on the initial mass, with much of the core being converted to nickel-56 and ejected which then powers the supernova for many months. At the lower end stars of about 140 M☉ produce supernovae that are long-lived but otherwise typical, while the highest mass stars of around 250 M☉ produce supernovae that are extremely luminous and also very long lived; hypernovae. More massive stars die by photodisintegration. Only population III stars, with very low metallicity, can reach this stage. Stars with more heavy elements are more opaque and blow away their outer layers until they are small enough to explode as a normal type Ibc supernova. It is thought that even in our own galaxy, mergers of old low metallicity stars may form massive stars capable of creating a pair instability supernova. ^ Gilmore, Gerry (2004). "The Short Spectacular Life of a Superstar". Science. 304 (5697): 1915–1916. doi:10.1126/science.1100370. PMID 15218132. ^ "Introduction to Supernova Remnants". NASA Goddard/SAO. 2006-09-07. Retrieved 2007-05-01. ^ a b Richmond, Michael. "Late stages of evolution for low-mass stars". Rochester Institute of Technology. Retrieved 2006-08-04. ^ a b c d Hinshaw, Gary (2006-08-23). "The Life and Death of Stars". NASA Wilkinson Microwave Anisotropy Probe (WMAP) Mission. Retrieved 2006-09-01. ^ Woosley, S.; Janka, H.-T. (December 2005). "The Physics of Core-Collapse Supernovae". Nature Physics. 1 (3): 147–154. arXiv:astro-ph/0601261. Bibcode:2005NatPh...1..147W. doi:10.1038/nphys172. ^ Clayton, Donald (1983). Principles of Stellar Evolution and Nucleosynthesis. University of Chicago Press. ISBN 978-0-226-10953-4. ^ Fleurot, Fabrice. "Evolution of Massive Stars". Laurentian University. Archived from the original on 2017-05-21. Retrieved 2007-08-13. ^ Lieb, E. H.; Yau, H.-T. (1987). "A rigorous examination of the Chandrasekhar theory of stellar collapse". Astrophysical Journal. 323 (1): 140–144. Bibcode:1987ApJ...323..140L. doi:10.1086/165813. ^ a b Fryer, C. L.; New, K. C. B. (2006-01-24). "Gravitational Waves from Gravitational Collapse". Max Planck Institute for Gravitational Physics. Archived from the original on 2006-12-13. Retrieved 2006-12-14. ^ Hayakawa, T.; Iwamoto, N.; Kajino, T.; Shizuma, T.; Umeda, H.; Nomoto, K. (2006). "Principle of Universality of Gamma-Process Nucleosynthesis in Core-Collapse Supernova Explosions". The Astrophysical Journal. 648 (1): L47–L50. Bibcode:2006ApJ...648L..47H. doi:10.1086/507703. ^ a b Fryer, C. L.; New, K. B. C. (2006-01-24). "Gravitational Waves from Gravitational Collapse, section 3.1". Los Alamos National Laboratory. Archived from the original on 2006-10-13. Retrieved 2006-12-09. ^ a b Mann, Alfred K. (1997). 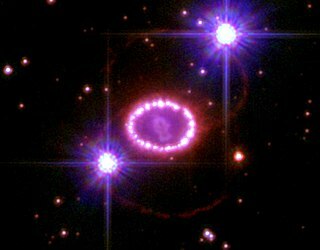 Shadow of a star: The neutrino story of Supernova 1987A. New York: W. H. Freeman. p. 122. ISBN 978-0-7167-3097-2. ^ Gribbin, John R.; Gribbin, Mary (2000). Stardust: Supernovae and Life – The Cosmic Connection. New Haven: Yale University Press. p. 173. ISBN 978-0-300-09097-0. ^ Barwick, S.; Beacom, J.; et al. (2004-10-29). "APS Neutrino Study: Report of the Neutrino Astrophysics and Cosmology Working Group" (PDF). American Physical Society. Retrieved 2006-12-12. ^ Fryer, Chris L. (2003). "Black Hole Formation from Stellar Collapse". Classical and Quantum Gravity. 20 (10): S73–S80. Bibcode:2003CQGra..20S..73F. doi:10.1088/0264-9381/20/10/309. ^ Fryer, Chris L. (1999). "Mass Limits For Black Hole Formation". The Astrophysical Journal. 522 (1): 413–418. arXiv:astro-ph/9902315. Bibcode:1999ApJ...522..413F. doi:10.1086/307647. ^ Izzard, R. G.; Ramírez Ruiz, E.; Tout, C. A. (2004). "Formation rates of core-collapse supernovae and gamma-ray bursts". Monthly Notices of the Royal Astronomical Society. 348 (4): 1215. arXiv:astro-ph/0311463. Bibcode:2004MNRAS.348.1215I. doi:10.1111/j.1365-2966.2004.07436.x. ^ a b Rampp, M.; Buras, R.; Janka, H.-T.; Raffelt, G. (February 11–16, 2002). "Core-collapse supernova simulations: Variations of the input physics". Proceedings of the 11th Workshop on "Nuclear Astrophysics". Ringberg Castle, Tegernsee, Germany. pp. 119–125. arXiv:astro-ph/0203493. Bibcode:2002nuas.conf..119R. ^ Ackerstaff, K.; et al. (The OPAL Collaboration) (1998). "Tests of the Standard Model and Constraints on New Physics from Measurements of Fermion-pair Production at 189 GeV at LEP". The European Physical Journal C. 2 (3): 441–472. arXiv:hep-ex/9708024. doi:10.1007/s100529800851. Retrieved 2007-03-18. ^ "The Nobel Prize in Physics 2004". Nobel Foundation. 2004-10-05. Archived from the original on 2007-05-03. Retrieved 2007-05-30. ^ Stover, Dawn (2006). "Life In A Bubble". Popular Science. 269 (6): 16. ^ Janka, H.-T.; Langanke, K.; Marek, A.; Martínez Pinedo, G.; Mueller, B. (2007). "Theory of Core-Collapse Supernovae". Bethe Centennial Volume of Physics Reports. 142 (1–4): 38–74. arXiv:astro-ph/0612072. Bibcode:1993JHyd..142..229H. doi:10.1016/0022-1694(93)90012-X. ^ Iwakami, Wakana; Kotake, Kei; Ohnishi, Naofumi; Yamada, Shoichi; Sawada, Keisuke (March 10–15, 2008). "3D Simulations of Standing Accretion Shock Instability in Core-Collapse Supernovae" (PDF). 14th Workshop on Nuclear Astrophysics. Archived from the original (PDF) on 15 March 2011. Retrieved 30 January 2013. ^ Blinnikov, S.I. ; Röpke, F. K.; Sorokina, E. I.; Gieseler, M.; Reinecke, M.; Travaglio, C.; Hillebrandt, W.; Stritzinger, M. (2006). "Theoretical light curves for deflagration models of type Ia supernova". Astronomy and Astrophysics. 453 (1): 229–240. arXiv:astro-ph/0603036. Bibcode:2006A&A...453..229B. doi:10.1051/0004-6361:20054594. ^ Young, Timothy R. (2004). "A Parameter Study of Type II Supernova Light Curves Using 6 M He Cores". The Astrophysical Journal. 617 (2): 1233–1250. arXiv:astro-ph/0409284. Bibcode:2004ApJ...617.1233Y. doi:10.1086/425675. ^ Rauscher, T.; Heger, A.; Hoffman, R. D.; Woosley, S. E. (2002). "Nucleosynthesis in Massive Stars With Improved Nuclear and Stellar Physics". The Astrophysical Journal. 576 (1): 323–348. arXiv:astro-ph/0112478. Bibcode:2002ApJ...576..323R. doi:10.1086/341728. ^ a b Doggett, J. B.; Branch, D. (1985). "A Comparative Study of Supernova Light Curves". Astronomical Journal. 90: 2303–2311. Bibcode:1985AJ.....90.2303D. doi:10.1086/113934. ^ "Type II Supernova Light Curves". Swinburne University of Technology. Retrieved 2007-03-17. ^ Filippenko, A. V. (1997). "Optical Spectra of Supernovae". Annual Review of Astronomy and Astrophysics. 35: 309–330. Bibcode:1997ARA&A..35..309F. doi:10.1146/annurev.astro.35.1.309. ^ Pastorello, A.; Turatto, M.; Benetti, S.; Cappellaro, E.; Danziger, I. J.; Mazzali, P. A.; Patat, F.; Filippenko, A. V.; Schlegel, D. J.; Matheson, T. (2002). "The type IIn supernova 1995G: interaction with the circumstellar medium". Monthly Notices of the Royal Astronomical Society. 333 (1): 27–38. arXiv:astro-ph/0201483. Bibcode:2002MNRAS.333...27P. doi:10.1046/j.1365-8711.2002.05366.x. ^ Langer, N. (22 September 2012). "Presupernova Evolution of Massive Single and Binary Stars". Annual Review of Astronomy and Astrophysics. 50 (1): 107–164. arXiv:1206.5443. Bibcode:2012ARA&A..50..107L. doi:10.1146/annurev-astro-081811-125534. ^ Kiewe, Michael; Gal-Yam, Avishay; Arcavi, Iair; Leonard, Douglas C.; Enríquez, J. Emilio; Cenko, S. Bradley; Fox4, Derek B.; Moon, Dae-Sik; Sand, David J.; Soderberg, Alicia M. (2011). "Caltech Core-Collapse Project (CCCP) observations of type IIn supernovae: typical properties and implications for their progenitor stars". The Astrophysical Journal. 744 (10): 10. arXiv:1010.2689. Bibcode:2012ApJ...744...10K. doi:10.1088/0004-637X/744/1/10. ^ a b Utrobin, V. P. (1996). "Nonthermal ionization and excitation in Type IIb supernova 1993J". Astronomy and Astrophysics. 306 (5940): 219–231. Bibcode:1996A&A...306..219U. ^ Nomoto, K.; Suzuki, T.; Shigeyama, T.; Kumagai, S.; Yamaoka, H.; Saio, H. (1993). "A type IIb model for supernova 1993J". Nature. 364 (6437): 507. Bibcode:1993Natur.364..507N. doi:10.1038/364507a0. ^ Chevalier, R. A.; Soderberg, A. M. (2010). "Type IIb Supernovae with Compact and Extended Progenitors". The Astrophysical Journal. 711 (1): L40–L43. arXiv:0911.3408. Bibcode:2010ApJ...711L..40C. doi:10.1088/2041-8205/711/1/L40. ^ Krause, O.; Birkmann, S.; Usuda, T.; Hattori, T.; Goto, M.; Rieke, G.; Misselt, K. (2008). "The Cassiopeia A supernova was of type IIb". Science. 320 (5880): 1195–1197. arXiv:0805.4557. Bibcode:2008Sci...320.1195K. doi:10.1126/science.1155788. PMID 18511684. ^ Woosley, S. E.; Pinto, P. A.; Martin, P. G.; Weaver, Thomas A. (1987). "Supernova 1987A in the Large Magellanic Cloud - the explosion of an approximately 20 solar mass star which has experienced mass loss?". The Astrophysical Journal. 318: 664. Bibcode:1987ApJ...318..664W. doi:10.1086/165402. ^ Filippenko, Alexei V. (1988). "Supernova 1987K - Type II in youth, type Ib in old age". Astronomical Journal. 96: 1941. Bibcode:1988AJ.....96.1941F. doi:10.1086/114940. ^ Filippenko, Alexei V.; Matheson, Thomas; Ho, Luis C. (1993). "The Type IIb Supernova 1993J in M81: A Close Relative of Type Ib Supernovae". Astrophysical Journal Letters. 415: L103. Bibcode:1993ApJ...415L.103F. doi:10.1086/187043. ^ Nomoto, K. I.; Tanaka, M.; Tominaga, N.; Maeda, K. (2010). "Hypernovae, gamma-ray bursts, and first stars". New Astronomy Reviews. 54 (3–6): 191. Bibcode:2010NewAR..54..191N. doi:10.1016/j.newar.2010.09.022. ^ "Cosmological Gamma-Ray Bursts and Hypernovae Conclusively Linked". European Organisation for Astronomical Research in the Southern Hemisphere (ESO). 2003-06-18. Retrieved 2018-02-19. ^ Kasen, D.; Woosley, S. E.; Heger, A. (2011). "Pair Instability Supernovae: Light Curves, Spectra, and Shock Breakout" (PDF). The Astrophysical Journal. 734 (2): 102. arXiv:1101.3336. Bibcode:2011ApJ...734..102K. doi:10.1088/0004-637X/734/2/102. List of all known Type II supernovae at The Open Supernova Catalog. Merrifield, Michael. "Type II Supernova". Sixty Symbols. Brady Haran for the University of Nottingham. "How to blow up a star". Elizabeth Gibney. Nature. 2018-04-18. Retrieved 2018-05-04.